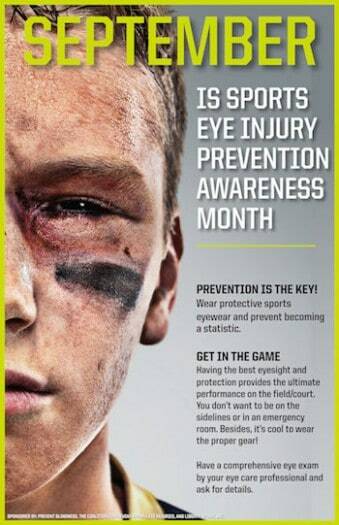 This month is all about preventing sports injury. With fall sports starting up this is the perfect month to discuss how to prevent injury. A lot of people are under the assumption that just wearing glasses is enough to protect your eyes. First of all the one thing that all eyeglass wearers need to know is that the only type of lens that is shatter proof is called polycarbonate. A regular plastic lens if hit has the potential to shatter and cause eye injury. The best defense in preventing sports injury would be to wear sports goggles that are specifically made for sports. Another option would be to consider being fitted for contact lenses for wearing during sports. It has been estimated that over 40,000 people a year visit the emergency room with eye injuries. If you are wondering if your glasses would be safe to wear while playing sports stop by our office today and we are more than happy to check them for you.